Chennai Super Kings overwhelmed RR by 4 wickets in this IPL’s yet another last over thriller, thanks to Mitchell Santner's last-ball six. It was one of the most dramatic and thrilling IPL final overs, which included a couple of sixes, a free-hit, a wicket and a controversy over revoked no-ball decision. Dhoni and Ambati Rayudu scripted CSK victory with their 95 runs partnership for the fifth wicket. CSK outplayed RR in all the departments, with a collective effort from players like Rayudu, Ravindra Jadeja and Deepak Chahar. With Jos Buttler’s 10 balls 23 and Shreyas Gopal’s 19 off 7, Rajasthan managed to go past 150 runs mark, although no batsmen crossed 30 runs and that hurt the team eventually. Deepak Chahar tops the bowlers’ dot-balls chart with 84 dot balls in 7 matches. CSK and RR remain at their 1st and 7th positions respectively in the points table. Rajasthan were sent in to bat first by CSK. Contrary to earlier matches, RR began their innings aggressively. They also looked confident with the return of Sanju Samson at number 3. Buttler started the attack in the first over, as he hit a four and a six to Chahar. Rahane followed him with a couple of fours to Santner in the next. At 31-0 in 2.5 overs, Rahane fell to Chahar after a last-second review call from Dhoni. Buttler hit 3 consecutive boundaries to Shardul Thakur in the fourth over before giving a catch to Rayudu. By the end of the powerplay, RR looked better this time with 54 for 3. The middle order failed as it was typical RR batting at display after initial few overs. Ben Stokes helped RR with much needed 28 runs, while Gopal’s heroic onslaught ensured RR go beyond 150 runs, but Rahane had to admit, it was not a good enough target. RR got a good start with the ball as Dhawal Kulkarni bowled-out Watson in the first over, with the dream out-swinging delivery. Jofra Archer ran-out lazy Suresh Raina with his brilliant throw, while Unadkat got the wicket of du Plessis in the fourth over. RR had claimed fourth CSK wicket in Kedar Jadhav, thanks to Stokes’ sensational, flying catch, limiting CSK to 24 in 6 overs. But thereafter, RR bowlers could not get scalps of Dhoni and Rayudu before it was too late. 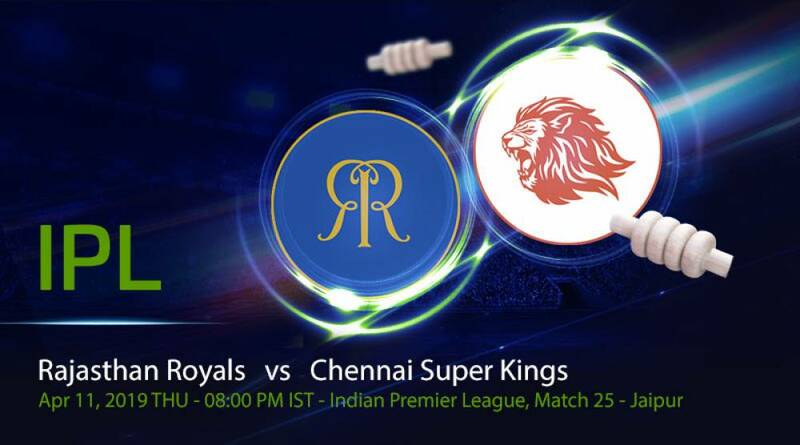 RR had to defend 30 runs in the last two overs, unfortunately, Archer and Stokes could not stop the Super Kings from stealing the thrilling victory. Buttler made 23 at the strike rate of 230 while Stokes scored 28 off 26 balls and took two wickets for 39 runs. Archer and Kulkarni got 1 wicket each for 19 and 14 runs respectively. It was a good toss to win and opt to chase, as CSK are quite successful in chases. Adhering to the plans, CSK bowlers took three crucial wickets of the captain Rahane, Buttler and Samson in RR’s powerplay. With this, CSK were quite in charge early in the game. Their bowlers kept taking wickets at regular intervals, which restricted the runs flow. Jadeja got the wicket Steven Smith in 11th over to demolish RR’s hopes of high scores. Thakur gave away 18 runs in the last over as CSK received the target of 152. The run chase of CSK was nothing short of a roller costar ride. Losing four wickets in 24 runs in the powerplay, the burden once again came on the reliable shoulder of Dhoni. He and Rayudu registered 95 runs partnership for the fifth wicket. In the 10th over, Dhoni stepped out for a sixer and silenced the hosts. In the next over, he smashed another six to Parag. Rayudu too joined him from the other end, hitting some big shots. CSK needed 18 in the last over but with the presence of Dhoni, the pressure was on RR. Jadeja hit Stokes’ first ball for a sixer. Feeling the pressure, Stokes went for a no-ball, however, Dhoni could not maximize the free-hit ball. He got bowled out with a beautiful yorker in the next ball. The fourth ball created a big controversy as the leg umpire revoked already declared no-ball. It appalled Dhoni so much that he entered the field and argued with the umpires. In the end, Santner sealed the match with the last-ball sixer. For CSK, Chahar, Thakur and Jadeja picked up two wickets each, however, Jadeja was the most economical among others, conceding just 20 runs. Dhoni was the top scorer and awarded the player of the Match for his 43-ball 58. Rayudu scored 57 in 47 balls. Rajasthan Royals will play against third-ranked Mumbai Indians on 13th April at Wankhede Stadium, Mumbai. It’s becoming a difficult season both for the team and the Captain but they need to pull up the socks, focus on each match and go for the alluring victory. Top ranked Chennai Super Kings will play second ranked KKR at Eden Gardens, Kolkata on 14th April. CSK will look forward to repeating their home-match outcome and beat KKR again. The way Dhoni and his team are playing, it is highly likely they will bag another two points.